In autumn 2014, Openreach applied for the right to use unmetered power supplies for the cabs. As part of this, they provided a breakdown of the makeup of a large subsample of their cabs. So ECI provided about 45% of the sample, while the sample represented about 62% of the installed base. If the subsample was representative of the whole, then there will have been around 25,000 ECI cabinets in total. BT had largely finished the commercial rollout at this time, and was well into the BDUK projects. What I have seen suggests to me, as others have seen, that Huawei has taken the lion's share of the BDUK market. Not exclusively at the start, for sure. But I have seen plenty of exchanges that were ECI-only in the commercial rollout, that went with Huawei for the additional BDUK cabinets. BT now have around 80,000 cabinets. If the extra 25,000 cabinets were all Huawei, and the 2014 sub-sample was representative of the whole, then ECI would now be about 31% of the installed base. BT originally trialled ECI in York, and that exchange has early and late examples of ECI cabinets being deployed, from late 2010 to early 2015 - with a smattering of BDUK Huawei's also appearing in 2013-15 too. However, the 2017 cabinets are only Huawei's; March 2015 is the most recent ECI installation I have seen (unless you know better), so that 31% estimate might well be a reasonable one. Unlikely, though possibly from a result of delayed planning. They stopped installing ECI cabs many months ago. For a while ECI's were only used to add capacity for existing ECI installations. Any new FTTC deployments have been Huawei for some time now though. It was round about October 2016 they started adding Huawei to existing ECI cabinets. An ECI went live on my exchange (PCP 30 ESDAL) about a month ago, but the actual shell of the cab was erected over 2 years ago. Power issues delayed the cab going live. Any "new" ECI will likely have been in the planning from before any decision to completely ditch them. It is correct - but then so also is j0hn's comment "possibly from a result of delayed planning". The cabinet is in Faversham near a road junction (A251/A2) that is due for upgrade (potential for roundabout / traffic lights / other). Originally we were planned to have FTTC in September 2015, but when the council announced that the junction was due for development, that plan obviously went on hold (at least, that's what I'm guessing). About 6 months ago the junction's future was finalised (a roundabout) and I think BT then took their plans off-hold. Obviously they'd had an ECI cabinet in storage all that time, ready to install. That's unfortunate. However it must be better than nothing. I see you are consuming the Openreach 40/10 Mbps product. By looking at the "Max" line, we see that leaves plenty of "headroom" for the effects of cross-talkers, etc. latest stats, still on b206 chipset version. Here's mine. I'm on d086 with my AAISP line where the Zen line (now cancelled and fully refunded) was on b206. Line length is about 450m. Not sure what mines currently on as I'm at work, but I'm surprised at how different mine and Ixels connection are given I'm also about 450 meters, possibly a little longer and on an ECI. Mind you I shouldn't really be surprised, I've always known my lines be at the bottom end of performance for the distance. My connection sits around 47/8 at the moment, during a very brief power cut last night my attainable was around 57/10 if I remember correctly. I'm curious to know what version your line card is running. Two factors helped me though I believe. 1) The line card, the firmware 0xd086 version seemed to give me a speed boost compared to my other line which was on a line card running a different version (0xb206). 2) The SFI engineers. The very final one if I recall correctly did his best to find me the best possible pair along the route to the cabinet, checking every section of the route from the house to the cabinet. 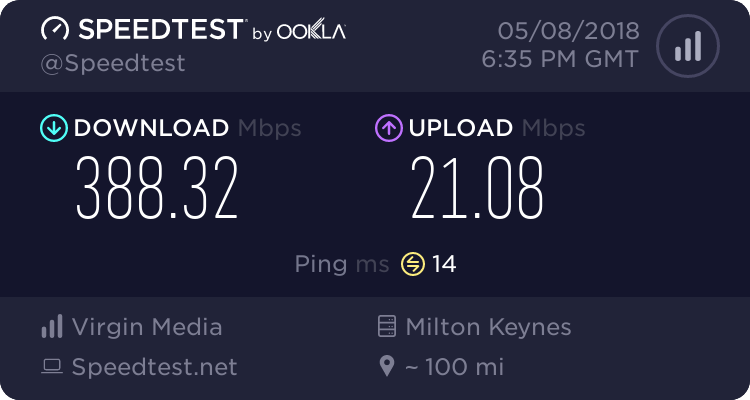 Although a problem is still present I'm happy with things as they are, just need to shake off interleaving again as I'd rather have a reduction in connection speed than +8ms on my ping. I notice it in first person shooters, hard to explain.